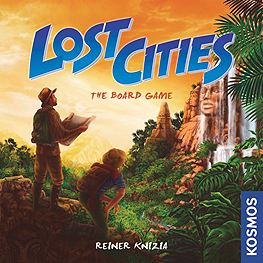 Each player guides a team of explorers on up to five expeditions. To advance along an expedition path, a card in the path's colour must be played for each step forward. The card must be of equal or greater value to the player's card previously played on that path. Points are awarded based on how far the explorers make it along their paths. Each step earns more points than the one before it, and the first three steps earn negative points. Along the way, players can increase points by finding artifacts, victory points, and shortcuts forward. The player with the most points at the end of the game wins.